You can now find some show-specific lists of sponsors for The O’Reilly Factor, Fox & Friends and the Glenn Beck Show at the pages below. 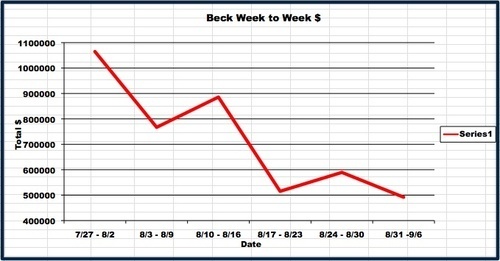 Want to see what losing 62 advertisers did to Glenn Beck‘s bottom line? Check out this graph from Gawker showing his FNC ad revenue drop more than 50%!